Home baby baby girl Grace Three Months. A quarter of a year old already. You are growing like a weed little one and you already have such a personality. .You LOVE daddy. I knew you'd be a daddy's girl, but goodness gracious. We are talking following him around the room with your eyes, smiling his way even if he isn't looking, and laughing at almost everything he does. It melts momma's heart to hear you two interact. .You've also started having more interest in your brother. You will sit there and stare at him. If you make eye contact with him he takes it as an invitation for kisses. To which you still aren't too sure about. .You talk, a lot. And loudly. .You aren't a fan of events that take place after 8 pm. You and daddy are one in the same with wanting to cuddle and do nothing from 8 to bedtime. .You love to nurse to sleep. You love to nurse period. You love to use mommy as a pacifier. .You still love to nap in your swing. .You are still wearing size 2 diapers. 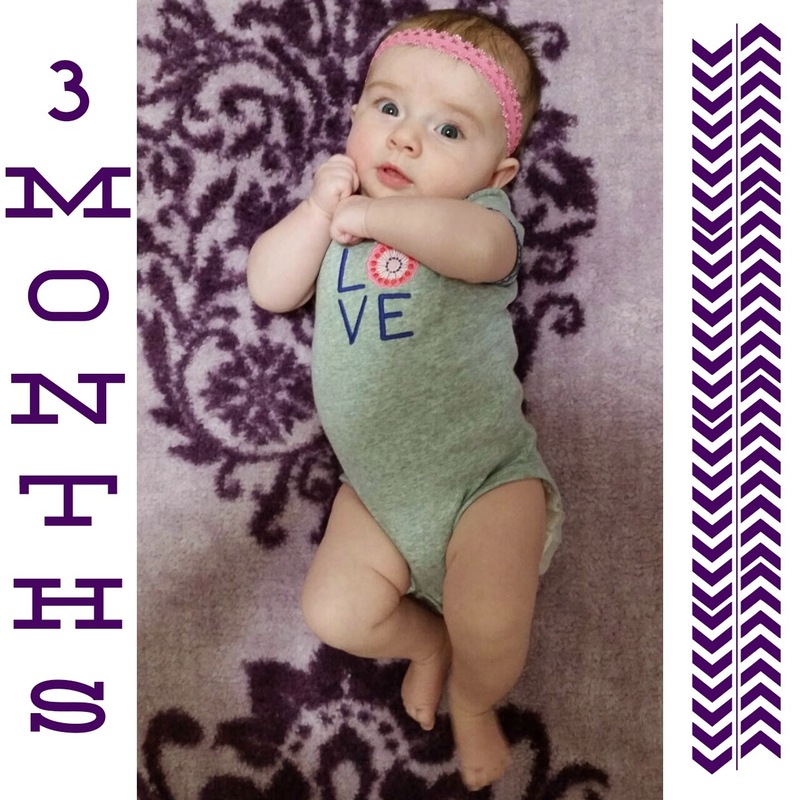 .You have transitioned into 3 month clothing and some 3 to 6 month outfits. .You fall asleep between 11 and 12 still. And sleep for a good long stretch before starting your up every two hour to nurse game. I'm okay with it. .You don't like loud sounds that startle you. Your little lower lip will pucker out and you'll fuss. .You always have your hands or a toy in your mouth. So far you have only shown interest in soft toys. The hard ones still are not very much fun. .You broke your first tooth this month. You didn't have a lot of teething problems with it other than a few days of extra fuss. It's on your lower left side, so not super noticeable yet. .You are a social butterfly that will smile and talk to anyone. You love to be held and don't care who is holding you (unless you are tired or hungry of course). .You love attention. If nobody is interacting with you, you will "talk" loudly until someone responds. .You still look exactly like your daddy.. but several of mommy's friends and family have said they see me in you. Which makes mommy veryyy happy! This next month is a big one for you baby girl. You will go on your first road trip and get to meet a lot of people that are very important in mommy and daddy's life. I can't wait to introduce you to everyone. Not to mention watch you grow more. You are such a smart beautiful girl and as usual I am so so lucky to be your momma! 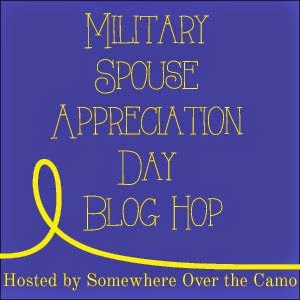 Don't forget y'all... military spouse/significant other link-up goes live Friday morning! Stop by, add your link and meet some new bloggers! I can't believe she cut her first tooth already! My two waited forever, miserably dragging it out. My daughter was a Daddy's Girl from the beginning too. I need to remember to link up! I actually have a post on Friday about what I've learned being a military spouse. Wow she is growing like crazy! Such a precious girl! She's growing so fast! Happy 3 months, baby girl! It goes by so fast, and she is beautiful!!!!!!!!! So cute! Hard to believe it's been 3 months already! She's sooooo precious!!! She looks so much more aware than some 3 month old's!